Since making his Verizon IndyCar Series debut in 2012, Tennessee-native Josef Newgarden was tabbed as a future star on the circuit. And while the CFH Racing driver has long been one of open wheel racing’s most popular drivers, there was always a lack of high finishes and most importantly wins on his resume after three full seasons. After Sunday afternoon’s Honda Indy Grand Prix of Alabama at Barber Motorsports Park in Birmingham however, it is time to remove the veteran’s name off the “best driver not to win a race” list. Starting the 90-lap event from the number four spot, Newgarden vaulted to the top of the standings during the first full course caution of the day on lap 22 and would regain the position just prior to halfway point despite a lackluster second pit stop prior to it. The key move of the race would come on lap 39, when on the final restart of the day Newgarden was able to get past Team Penske’s Helio Castroneves. While only good for eighth place at the time, the move put the No. 67 Hartman Oil Chevrolet first among those who would only need to stop once more to make the finish. At the head of the order, Graham Rahal piloting the No. 15 Steak & Shake Restaurants Honda for Rahal Letterman Lanigan Racing would require two stops to make the distance. When Newgarden pitted from the lead with 27 laps to go, fuel was obviously a concern, however a buffer was created when the lapped car of Dale Coyne Racing’s Francesco Dracone held up second and third place running Scott Dixon and Castroneves, with the ensuing five second lead perhaps allowing the CFH pilot an opportunity to conserve just enough Sunoco fuel to make the checkered flag. Newgarden would reclaim the top spot when Rahal would top off the tank at lap 70 leaving the Ohio-native in fourth place, but with fresh tires and no need to conserve gas. With nothing to lose Rahal began his charge, gaining up to two seconds per lap in the late running as those in front of him turned down their pace to ensure they would not require an emergency splash of fuel to make the finish. Proving a Honda-powered car could contend for victories on Sunday, Rahal took third from Castroneves with nine laps to go and two laps from the finish was right on the tail of the No. 9 Coca-Cola Chevrolet of Dixon. Eventually on the final lap, Rahal was able to find a way past the New Zealander to earn runner-up honors on the day, but not enough to chase down Newgarden. 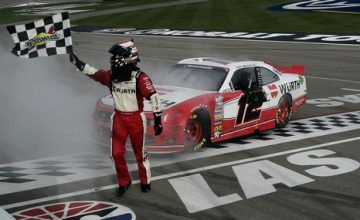 Dixon would round out the podium, while Castroneves was unable to extend his fuel to the finish and was forced to make a late trip to pit road with two laps to go. The Team Penske driver, who claimed his second Verizon P1 award of 2015 on Saturday would finish 15th on Sunday. Despite an eventful race for the second straight weekend, Castroneves’ teammate Will Power would manage to bounce back and escape Barber Motorsports Park with a fourth place finish. The result came despite Power being hit with a drive through penalty for avoidable contact earlier in the race after the Australian collided with A.J. Foyt Racing’s Takuma Sato from behind, resulting in the first full course caution of two on the day. Andretti Autosport’s Ryan Hunter-Reay fell short in his quest to claim his third-straight victory at Barber Motorsports Park on Sunday, but was able to round out the top five. 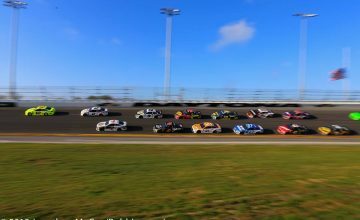 After being outclassed a bit by Chevrolet in the two races that did go the distance in 2015, Honda showed a competitive turn of pace on Sunday, as the two engine providers split the first ten positions at the checkered flag, each with five cars represented. 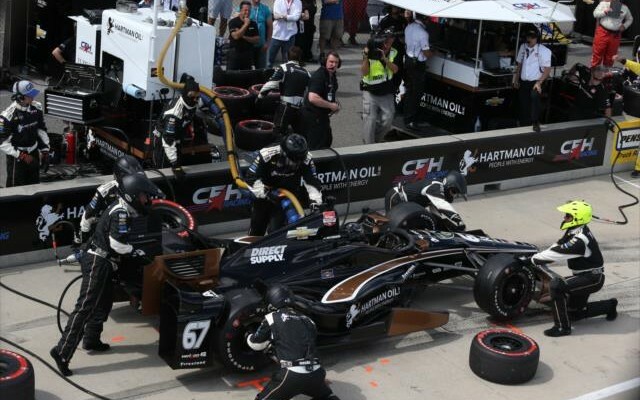 While the victory could spark a possible breakthrough for Josef Newgarden, the win is also the first for CFH Racing following the offseason merging between Ed Carpenter Racing and Sarah Fisher/Hartman Racing. The momentum could be big headed into the month of May at the Indianapolis Motor Speedway, where Newgarden and his teammates Ed Carpenter and J.R. Hildebrand all will be major contenders for victory in the 99th running of the Indianapolis 500. Of course, the Tennessee-native will have one more chance to claim a win before the 500-mile race, as in two weeks the Verizon IndyCar Series tackles the IMS road course for the second annual Angie’s List Grand Prix of Indianapolis. Stay tuned to Rubbings Racing for complete coverage of all the action from the Brickyard during the month of May.